As a Lutheran woman, how many times have you used a child’s Bible storybook? Perhaps you had a book about Jesus you loved as a child, or maybe you have sweet memories of reading Bible stories to your own children as you tucked them into bed. Maybe you’ve been a Sunday School or Lutheran day school teacher, and you’ve used Bible storybooks to teach your young charges the faith. However, countless women around the globe have never been so fortunate. To many, a Bible storybook is an unaffordable luxury or isn't available in their language at all. Through an LWML Mission Grant to the Lutheran Heritage Foundation (LHF), this situation is changing! 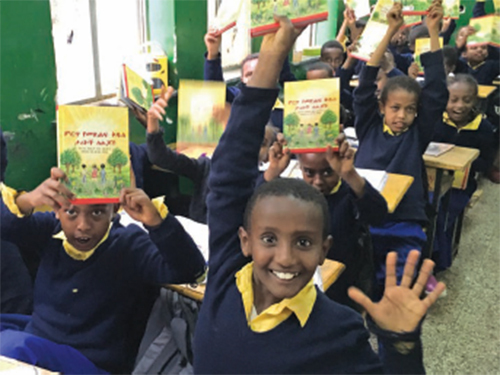 At the 2017 convention, delegates voted to provide $100,000 to LHF for translating, publishing, and distributing Lutheran Bible storybooks for children and families worldwide. One of the first storybooks is A Child’s Garden of Bible Stories, a colorfully-illustrated book of 60 Old and New Testament stories. It has been recently translated into the Farsi language, spoken in Iran. Although it’s very difficult to get Christian materials into Iran, “God has a way of opening doors for His children,” Rev. Heise shared. In 2015, more than a million refugees crossed into Europe, including over 100,000 immigrants from Iran. When they settled in countries like Germany and Denmark, Lutheran churches and missionaries saw a great opportunity to introduce those living in the darkness of Islam to the light of Jesus Christ. “The biggest challenge is the language,” explained Rev. Hugo Gevers, a Lutheran pastor in Leipzig, Germany. “How do you teach people who don’t know your language at all?” Once the 5,000+ copies of book are printed, they will be given free of charge to the Farsi-speaking families. In the coming months, LHF will continue to translate several more publications for new and growing Lutheran churches in Africa, Asia, and Europe. For many recipients — most of whom come from Muslim, Buddhist, or atheist backgrounds — the stories of God’s love bring peace and comfort. This has proven true for David, LHF’s lead Farsi translator of A Child’s Garden of Bible Stories. 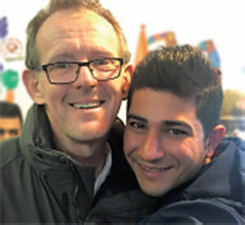 David grew up in a Muslim family in Iran, but after fleeing to Germany a few years ago, God led him to Rev. Gevers in Leipzig. Download or print the story. This story was originally featured in the Spring 2018 Lutheran Woman's Quarterly. Order your subscription here.